Goaltender Michal Neuvirth looks for the puck during the first period of the Flyers' 3-1 preseason win over the Islanders Monday night. For Michal Neuvirth, this isn't a make-or-break season. But it's close to it. Neuvirth, the 30-year-old Flyers goaltender, is in the final season of a two-year contact that has an annual $2.5 million cap hit. He is coming off an injury-plagued 2017-18 campaign in which he played just 22 games and then had surgery on both hips in the spring. The Czech Republic native is trying to stay healthy for a full season for the first time in his career. He is also trying to forget about last season. 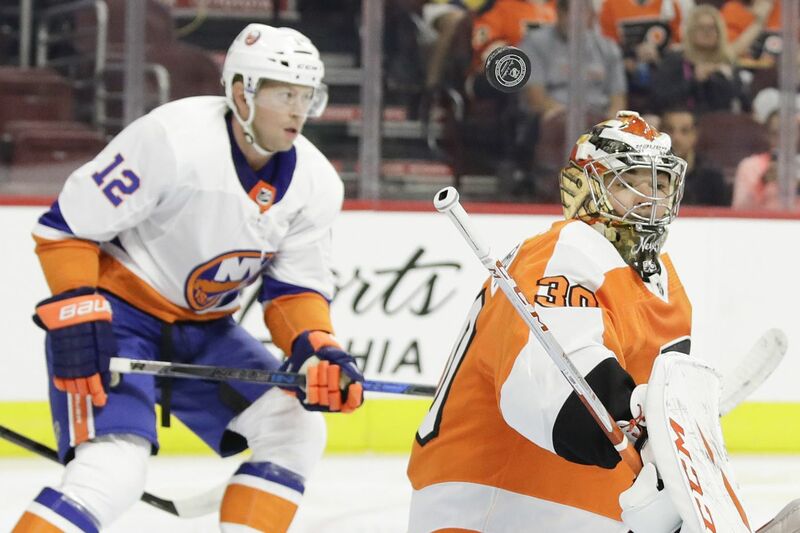 "Whatever happened last year doesn't matter anymore," said Neuvirth before playing half the game and stopping eight of nine shots in his preseason debut Monday, helping the Flyers defeat the New York Islanders, 3-1, at the Wells Fargo Center. "Last year is in the books already and now I have to move forward and try to get better each day." Neuvirth, who had a 2.60 goals-against average and .915 save percentage last season, is trying to show the Flyers – and other teams that could pursue him if he reaches free agency on July 1 – that he is not a medical risk this season and beyond. In the summer, he stayed in the area and trained hard after recovering from his surgeries. "So far, I feel good, and hopefully it will pay off in the long run," he said. General manager Ron Hextall said it's an important training camp for Neuvirth "to prove to us he can stay healthy and play at a high level. Neuvy's capable of playing at a high level – and that's what we expect." The Flyers have five goalies left in camp: Neuvirth, Brian Elliott, Alex Lyon, Anthony Stolarz, and Carter Hart, the organization's 20-year-old wunderkind. Elliott, who had abdominal surgery in February and also needs to show he is healthy in camp, is the projected starter, and Neuvirth figures to be his backup. On Monday, Hart relieved Neuvirth, who survived a failed clearing attempt after he came at least 30 feet out of his net, midway through the second period and received a rousing ovation. Hart (11 saves on 11 shots) is viewed as the guy who will end the Flyers' long goalie search, but is expected to start the season with Lehigh Valley in the AHL. Coach Dave Hakstol liked the way Neuvirth and Hart looked "calm and settled" in the net Monday. Barring a trade, the Flyers could end up with Hart, Stolarz, and Lyon with the Phantoms. That sounds crowded. "It's not a perfect world, but I'd rather have three than one," Hextall said. "Sometimes, your problems can be worse. We'll deal with it if that happens." Showing great hands, Mikhail Vorobyov made a deft move and scored on a clever give-and-go with Jake Voracek to give the Flyers a 1-0 first-period lead against what resembled the Islanders' B team. Less than three minutes later, Shayne Gostisbehere (two goals) scored on a five-on-three point blast. Vorobyov "is a really smart player," Voracek said. "He's making really good decisions out there. Very impressive." Early in the second period, Gostisbehere scored on another power-play point drive as James van Riemsdyk set a screen in front. Claude Giroux (two assists) and Voracek (two assists) set up the goal. Vorobyov, a 21-year-old Russian who is battling Jordan Weal and Scott Laughton for the third-line center spot, centered the "V" Line, which included van Riemsdyk and Voracek. Van Riemsdyk was playing his first game since returning to the Flyers after signing as a free agent in the summer. Travis Sanheim's injury is minor, and the second-year defenseman is expected to miss a week as a precaution, Hextall said. Sanheim landed on his left shoulder when he was checked into the boards Sunday by the Islanders' Matt Martin. Hextall also said Andrew MacDonald (lower-body injury) was progressing ahead of schedule and might not miss the first two weeks of the season, as originally projected. Hextall on Morgan Frost's play in Sunday's 3-0 loss to the host Islanders: "I thought he was in that group that was a little bit intimidated in terms of where they were; he was pretty quiet. "…Laughton played left wing Monday but will move to center in other games this week, said Hakstol, whose team meets the Islanders (again) in Brooklyn on Tuesday.